This is a personal project. I've been fascinated by bird diversity — as represented by bird families — since I was given a book on bird families (Austin 1961) as a child. My father loved travel so I got to circle the globe when young. I joined Van Remsen and other Bay Area birders in my first world birding trip (to Colombia) in 1975 but did not really focus on seeing a member of each bird family until the 1980s. I started web pages on Bird Families of the World in 1999 and kept track of newly proposed families or those lumped through new genetic research. Using the Clements world list as my standard, I finally completed my personal entire set of all the bird families on Christmas Day 2006, with Oilbird in Trinidad. Of course that did not last. Within a couple of years Egyptian Plover, Hylocitrea, and Rail-babbler were added to all global family lists. By the time I'd seen all of those (with Egyptian Plover in 2013), Magellanic Plover was a family, then came Elachura in 2014, and three new families that I had not seen in New Guinea were added in 2016. 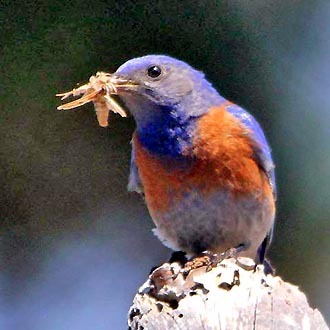 In 2017 the AOU added 9 new families of nine-primaried passerines; they added Royal-Flycatchers as a family in 2018 and Clements added Shrike-jay. I've continued to travel in search of the new families (Papua New Guinea, Tanzania) but as of this writing (July 2018) I'm now two families from the finish line — a line that keeps changing on all of us! By the turn of the 21st century, I'd also become interested in photographing every bird family but was hampered by the difficulty of taking slides in dark jungles. I started digi-scoping in 2006 and got a decent, if unimpressive, digital camera in 2007. That helped a lot but by then it was not possible or practical to redo decades of birding trips. I never will be able to photograph all the bird families. he is creating some wonderfully memorable shots along the way. You and I can follow his efforts on his web site: The Palliser Project. Tony Palliser is using the IOC list 6.1, with 240 families, as his standard. In the following 14 web pages I set out one photo of a bird from each family — using 257 families and sequence in my 16th edition Creagrus family list. Some photos are nice shots and some very marginal from years ago. [This is internet, so I can easily replace bad photos with better shots over time as luck permits.] You'll also see an icon of a guy with binoculars for families I've seen but not (yet) photographed, and also a blank spot for the two families I hope yet to see. On page 15 of this project is a personal gallery of previous families — those that were once considered a family by a major global publication (e.g., Austin 1961, Meyer de Schauensee 1970, Harrison 1979, Sibley & Monroe (1990), the Handbook of the Birds of the World 16-volume project, and a few others) — but that are now merged into other families. Sibley & Monroe (1990) was a watershed volume in its effect on bird families — anticipating much of today's molecular evidence — but also splitting cuckoos into 5 families and kingfishers into three but failing to anticipate the break-up of the Old World warblers into more than a dozen families or babblers into more than a half-dozen. On page 16 of this project is a personal gallery of proposed families — by current or recent IOC lists, by Fregin et al. (2012) or Barker et al. (2013), or by John Boyd's on-line Taxonomy in Flux list— but that neither Clements nor my own Creagrus project currently accepts. It is possible that the AOU or SACC, or Clements or me, may adopt some of these in the future. Others may be abandoned as time goes by. Fregin, S., M. Haase, U. Olsson & P. Alström. 2012. New insights into family relationships within the avian superfamily Sylvioidea (Passeriformes) based on seven molecular markers. BMC Evol. Biol. 12:157. Ohlson, J.I., R.O. Prum, and P.G.P. Ericson. 2007. A molecular phylogeny of the cotingas (Aves: Cotingidae). Mol. Phylog. Evol. 42: 25-37. Winkler, D.W., S.M. Billerman, and I.J. Lovette. 2015. Bird Families of the World: A Guide to the Spectacular Diversity of Birds. Lynx Edicions, Barcelona.